High temperatures combined with relatively high humidity (thanks to increased evaporation) will provide a favorable breeding ground for thunderstorms in much of central Europe today. Showers and thunderstorms are starting to move over the BeNeLux and into Germany currently (08.40 CEST), and will continue to move eastwards across Germany as the day progresses. They are expected to further intensify, with the potential for some storms to bring severe weather conditions. The possibility of storms clustering together to form long-lived “mesoscale convective systems” is also given. The main risks stemming from today’s thunderstorms are Large Hail with diameters potentially exceeding 2cm, as well as storm gusts which may exceed 120km/h in some thunderstorms, especially in northern Germany, and exceed 90km/h in many cases. Heavy rainfall is also not to be ruled out, with rain rates of up to 30l/sq. m in an hour certainly a realistic possibility. The potential for widespread flash-flooding is limited, however, due to the speed at which the thunderstorms are expected to move and the nature of the the individual storm cells. 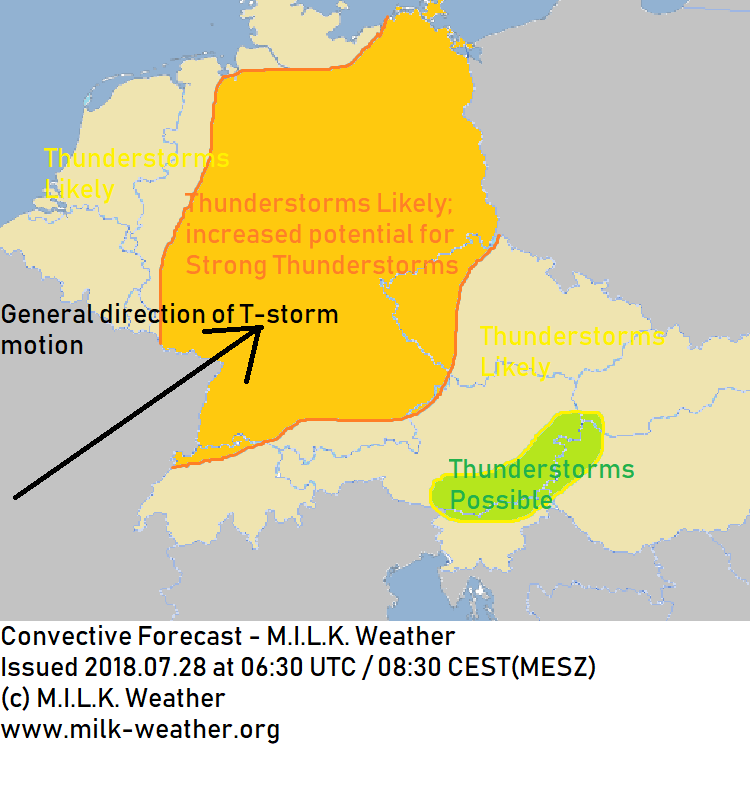 In Switzerland and southwestern Germany, conditions look favorable for the development of supercell thunderstorms, bringing a further elevated potential for severe weather. This entry was posted in Uncategorized on July 28, 2018 by Linus Höller.